My father, Dr. Bert Cunin, my family, and I wanted to express our deepest appreciation for honoring my mother, Dr. Beth Cunin, at the recent memorial and tree dedication ceremony several few weeks ago. The different components of the ceremony, as well as what likely went into its planning, and the people connected to it, were reflective to us of who and what RCC was for my mother: a place of learning and growth, of caring, of comradery, of achieving goals and accomplishments in all sizes RCC was the entity that, in addition to her family, was her heart and soul. 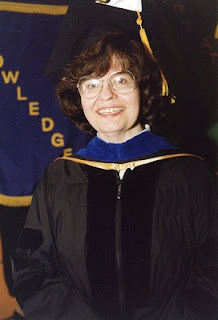 It is especially fitting at this time, commencement weekend, to recall how she loved graduation, to celebrate students and colleagues, reflect on the past and be hopeful for the future. If possible, we would so appreciate this being shared with any that a thank you is relevant to, especially including, but not limited to, Prof. Josephine Coleman and the Faculty Senate, Dr. Elaine Padilla and the Department of Social and Behavioral Sciences. Again, our deepest gratitude for all the years of respect, support, and opportunities given to my mother; may her good name, educational and caring legacy, and beautiful tree be ongoing sources of pride and goodness for years to come.